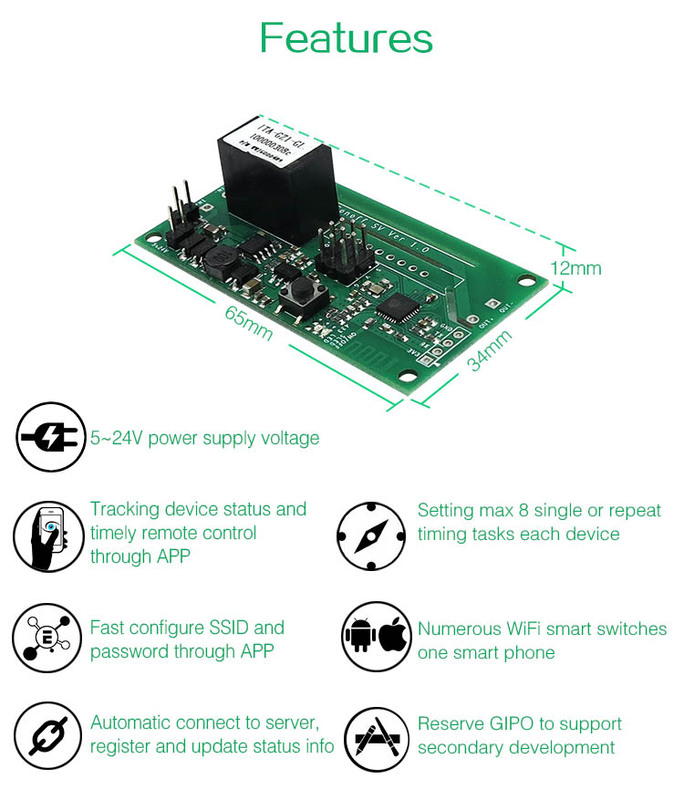 Sonoff SV(safe voltage) is a low power supply Sonoff ESP8266 based development board which supports 5-24V power supply. 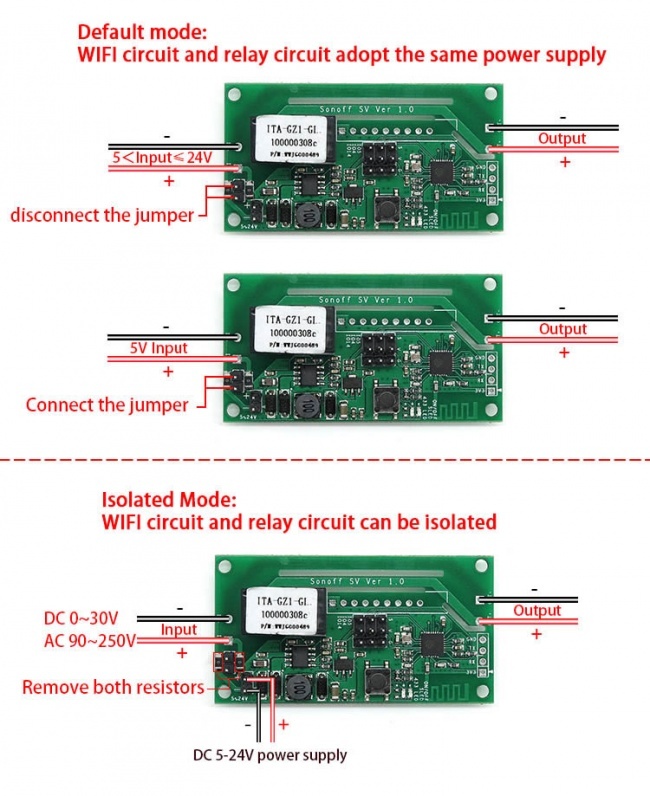 The power separation circuit enables it to control AC or DC power for the connected device, but you need to do some soldering to use this function, please refer to the soldering instructions below. Sonoff SV has GPIO reserved to support secondary development. This version does not have 433MHz RF function. Support fast configure SSID and password through APP. Support tracking device status and timely remote control through APP. Support setting single/repeat/countdown timing tasks. Reserve GIPO for secondary development. I have a patio with low voltage lights on top. This is powered by a low voltage transformer with an inline switch so that I can control when I want my lights on and off. I'd like to take the switch out and run my lights using the son off sv. I've tried to connect with the jumpers on, fried, removing the jumpers fried, removing 1 of the jumpers fried. Any help would be much appreciated. I'm know my way around electrical things but for some reason I'm an idiot here. Thanks! What instructions would they be? I can't image we would have advised you not to buy an SV from us. Do you know what the output voltage of the transformer is, 12V? AC or DC? Are you powering the SV from the output of the transformer? Which jumpers would they be? removing the jumpers fried, removing 1 of the jumpers fried. What actually burnt out? The SV, the transformer or the lights etc? I have 3 more and just need guidance on what I need to do. If possible. For some reason taking the sonoff putting the output wires of the transformer to the input of the sonoff clearly isn't right. Sorry I should have made that question a bit clearer, do you know if the output of the transformer is 12V AC or DC? If it is AC then you can't power the SV from it, it needs a DC source. If its just a transformer then its output is probably AC and that will be your problem. For jumper J8 it should be removed if you are powering the SV with anything above 5V. Inserting the jumper with a 12V supply would likely cause something to burn out. The two options that immediately come to mind is either to get a mains adapter with an output somewhere between 5 and 12V DC so that you can power the SV from the same source as you transformer or get a Sonoff basic which can be powered directly from the mains and you could use that to switch the power going into your transformer. Ah ok, the SV with its own power supply is the only thing I can think of then I'm afraid.